After you have selected a plan to edit or view, you are directed to the Step 2. Draw tab. Here, you will see a map for editing, tools to set your editing environment, and district statistics. All of these are important features to understand as they will enable you to draw a legal redistricting plan. Perhaps the first thing you will notice about the map of districts is that districts have coloring. Closer examination reveals that the counties that underlay the districts are also shaded. These colors are intended to provide you with clues and tools that enable you to draw legal redistricting plans. By default, the counties are shaded by their total population. The same is true for any other editable geography such as census tracts, census blocks, or precincts and wards -- we describe these editable geographies below. The pull down box in the upper left hand corner of the mapping area allows you to change how the editable geographies are shaded. The allowable shadings will vary with the available data and it is possible to turn off the shadings by selecting "None" (this may be useful if you wish to print your maps). % Dem Gov. '09, Two Party is an election result. Typically in redistricting, statewide races are used to evaluate the underlying partisan strength of districts, which is one factor to determining which parties' candidates are favored to win within a district. By "Two Party" we mean the vote for the Democratic and Republican candidates only -- this is typical in redistricting as the vote shares for the major political parties are most meaningful to the election outcome. The administrator may enable shading of geographies for more electoral contests and votes for minor political parties. Keep in mind that there is a lot of racial, ethnic, and political data that can be made available. These are illustrative examples that were used for a redistricting competition in Virginia. You can see what the shading for the geographic entities means by clicking on the Map Legend button. By default, the districts are shaded by their total population -- and how close they are to the ideal population for that legislative body. (The ideal population is the total population of the state divided by the number of districts in the legislative body.) The administrator may enable districts to be shaded by other values, such as the districts' compactness and contiguity status. You may also select to have no shading for the districts. The map above illustrates how districts may be shaded. Here, districts are shaded by how close their total population is to the ideal district population. The gold (or blue) colored districts are above the ideal population, with darker colors indicating that the districts are further from the ideal.A district that is not shaded is within the population tolerance set by the administrator. You can see what the shading for the districts means by clicking the Map Legend button in the lower right hand corner. When zoomed in, lower levels of geography will appear for editing. It is possible to show the boundaries for higher levels of geography by choosing the geographies in the "Show Boundaries" pull down menu. It is not possible to show lower levels of geography, for example, showing census blocks when zoomed out to the counties is not allowed. Behind the districts and the editable geographies such as counties is a map layer of roads, cities, and other features that helps provide context to where you are mapping. 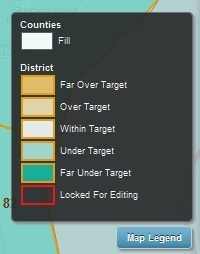 You can increase or decrease the transparency level of the districts and the editable geographies by moving the Roads transparency slider located in the upper right hand corner of the mapping area. To enable the map editing tools click on the EDIT MAP button located in the upper right hand corner of the browser window. Once you have clocked the EDIT MAP button, the map editing tools are displayed. You may return to the map editing environment tools by selecting the SELECT MAP VIEW button, which will replace the EDIT MAP button. The map editing tool set has a number of tools that allow you to get information about districts, select districts, and assign districts. To select any of these tools, click on the associated icon. The map tools allow you to show information about the map and change the editing environment. The Info Tool allows you to click on a geography and see it's name and the census and political data associated with it. The District Id Tool allows you to click on a district and see it's number. This tool is useful when zoomed in so far that district numbers may not be visible. The District Lock Tool allows you to click on a district and toggle it between being locked and unlocked. A locked district is highlighted in red. No changes may be made to a district that is locked. This is a useful tool when you have created a good district and want to make sure you do not inadvertently make a change to it. 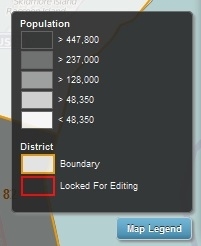 The District Lock Tool can also be useful to quickly select geography that has been split by districts. For example, if you wish to assign a county split by two districts, lock one of the two districts and select the county. Only the unlocked geography within the county will be selected. The District Lock Tool can sometimes be useful to find stray non-contiguous pieces of districts. The red outline of locked districts may be more visible than the unlocked gold colored outline. The Selecting Tools enable you to select geographies for assignment to a district. If you attempt to select a large number of geographies with any selection tool, you will receive an error message to select fewer geographies. When working at the census block level, it is often easy to select (and fail to select) many geographically small zero-population road and water segments, so be careful when working at this level. Click the Point Selection Tool icon. Click the geography you wish to select. By holding down "shift" while you click, you may add more geography to your selection. Click the Rectangle Selection Tool icon. Click the Lasso Selection Tool. While holding the mouse button, drag the mouse over the area you wish to select. Unlike the Rectangle Selection Tool, this is a freehand shape that you draw. The District Unassign Tool allows you to unassign an entire district. This is useful when used in conjunction with the district copy and paste feature, which requires an unassigned "slot" to copy a district into. 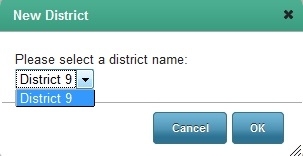 Click the District Unassign Tool. 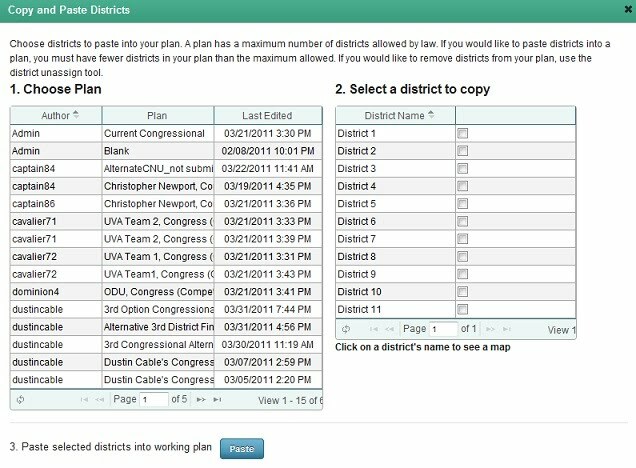 The District Copy and Paste Tool allows you to copy an entire district from a plan you are able to view -- any plan you can see in the Template, Shared, or My Plans file listings. It will be necessary to identify the plan and district you wish to copy the district from, so you should note this before starting this procedure. Also, it is necessary to have an open unassigned slot to copy the district into, so you may often need to use the District Unassign Tool to free up a slot. Choose the plan that you wish to copy the district from. The listing interface is similar to the Step 1. Plan select plan plan management interface. Select one or more districts in the plan that you wish to copy into your current plan. Remember, that you must have enough free district slots to copy the district(s) into. Copying and Pasting works similar to other district editing functions. You can use the undo feature to undo a change if you made a mistake. Any locked districts will not be affected. Often, the resulting copied districts will not assign all the unassigned geography on the map, so be careful! The heart of mapping is assigning a selected geographies to a district. There are two methods that we use to perform this task, the District Anchor Assigning Tool and the Grab and Drop Assigning Tool. The District Anchor Assigning Tool is also the tool that we use to create new districts, if there are still empty slots. The number of district slots is set by the administrator and typically will not exceed the maximum number of districts for a particular legislative body one is drawing districts for. The District Anchor acts like a paint tool. Any geography that is selected is automatically assigned to the district the anchor is associated with. (You may also assign to Unassigned status). To associate the Anchor with a district, select the district from the pull down list to the immediate right of the anchor icon. Click on the Grab and Drop icon. Use a selection tool to select geography. Once the geography is selected, it will be highlighted in yellow. Click on the selected geography. 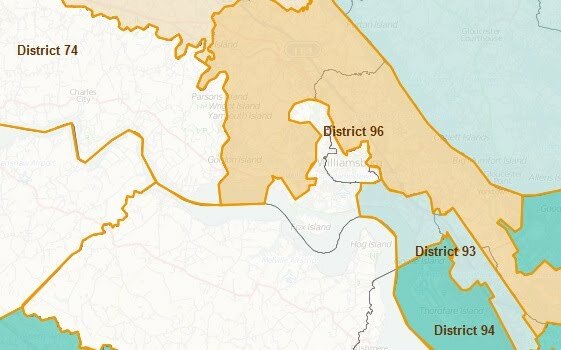 While holding down the mouse button, move the geography to the desired district. A common error occurs when you drop the geography back into the district it is currently assigned to. When this happens, you will receive the message, "No Districts Updated." You will be presented with a pop up window that asks which new district you wish to assign the geography to, among the available slots (in this case there is only one option, District 9). Select the district you wish to assign the geography to and click "OK".